The High Grade Industrial 24" microfiber mop is perfect if you need a large mop for cleaning open spaces. If your space has a lot of furniture then you should consider a smaller mop. 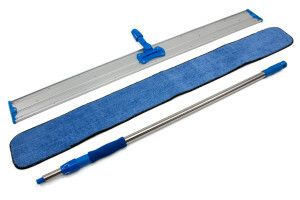 As with all of our microfiber mops (and unlike much of the competition) we recommend and supply pads that are two inches wider than the commercial grade microfiber mop hardware. 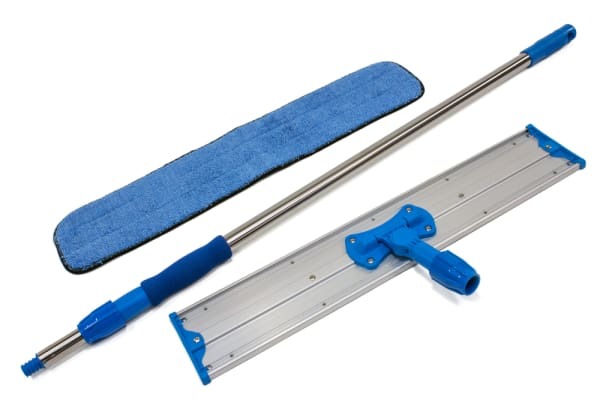 The reason that the edge of the mop pad should extend out past the hardware is to protect your baseboard and furniture edges when mopping up next to, and up against them. 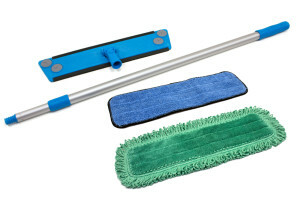 The 24" microfiber mop kit comes with the option for various types of 26" mop pads. You must select the type and quantity of mop pads that you require for your needs. The Microfiber Wet "Twist" Mop Pads, are the most common and popular type of microfiber mop pad. These industrial microfiber mop pads are gentle enough to be used on any floor surface, including hardwood, tile, and vinyl, yet have enough scrubbing ability to clean most common messes. The wet pads perform best when they are slightly wet or damp, and do not clean as well when they are completely saturated. For this reason we recommend wetting the pad or the area of the floor to be mopped with a spray bottle that contains water or your favorite cleaning solution. You can also wet the 24 inch microfiber dust mop pad under the sink or in a mop bucket but you must remove the excess water/solution prior to mopping for the pad the perform best. One of the major benefits of using this microfiber industrial dust mop kit system is that once the pads are dirty and saturated they can be removed and laundered, and replaced by a clean pad. Unlike traditional mopping systems this means that you are not mopping your floor with a dirty commercial mop, and dipping your mop back into a dirty water solution. 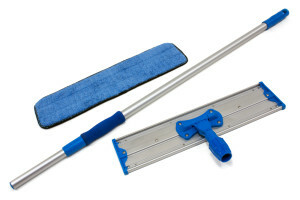 We offer two types of industrial dust mop pads for this 24 inch microfiber dust mop kit. The standard dust mop pad, and the Fringed dust mop pad. The fringed industrial microfiber dust mop pad has better reach into corners, edges and around furniture. 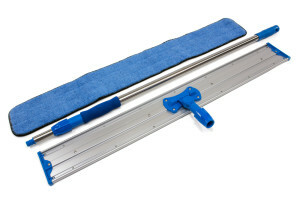 Both industrial dust mop kit pads are designed to pick up and hold onto small particles that are not easy to sweep with a broom. 24 in. x 4.25 in.